In honor of this most dubious holiday, I am highlighting something that is made of pure awesome. 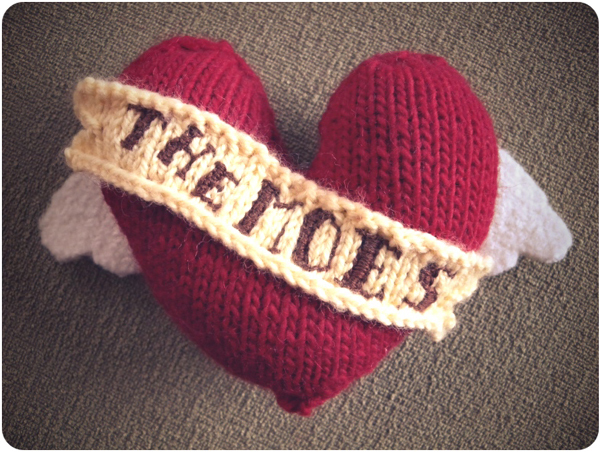 This winged heart was knit for us by the obscenely talented Tasha, of By Gum, By Golly. It was a few years back, when the economy was in a particularly cruel place, a little package from Chicago arrived unexpectedly the cheer us up. While sitting on the couch watching The Adventures of Ozzie & Harriet with Mr. Moe yesterday, I looked over and was reminded of this wonderful handmade gift. You can have the flowers and chocolates and diamonds — I’ve never been that kind of woman. Handmade ditties and cozy afternoons on the couch with your sweetheart make the best kind of Valentine’s Day to me. 2 Responses to "St. Valentine"
It truly is. We have it sitting on one of the shelves in the living room and we get some many compliments on it. Happy Valentine’s Day to you and Mel!